This site is about mc-set, a program that simulates electron trajectories in a specimen. Typically these trajectories are for electrons as part of a beam as found in Scanning Electron Microscopy (SEM), and the specimen under investigation can be anything (that fits inside the SEM''s chamber). More recently, the program has been used to simulate beta emission in radiactive materials used for example as betavoltaic batteries. The simulation uses the well know Monte Carlo method, in which some of the variables affecting the electron trajectory are randomly selected from a specific distribution of values. 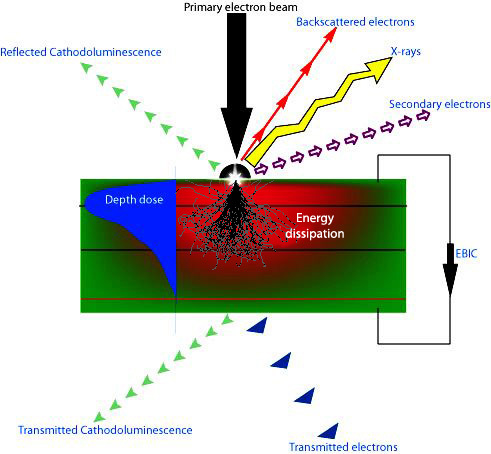 Based on the simulation of a large number of electrons, it is possible to have a picture of the electron beam''s behaviour inside the specimen under investigation. The electron trajectories calculations allow the estimation of various process related parameters, such as electron backscattering (coefficient, energy, angular/energy spectral distribution), seocndary electrons, X-rays generation, electron beam depth dose, and in general other paramenters that are linked to the beam energy dissipation properties in the specimen. The mc-set program is written in the C++ language, allowing for easy maintenance and modification. It can be used as a teaching tool, both in materials science and in computer programming, and additional modules can be easily (relatively...) integrated into the existing system. For example: CL and EBIC calculations, and parameters related to the transmission of the beam electrons through thin layers. Students and researchers that wish to add features to the program can be given the source code, to modify and use the program to do their own research. The web site reflects the changing nature of the program, and for this reason: if you come across something that is missing, either a single image or a complete subject, please contact me and let me know so the issue can be fixed. Also, if you have any comments, or problems, about the simulation or about the web site, please let me know.